The Riva storage platform bed is an economic and practical choice for your bedroom. Slats are included, eliminating the requirement for a box spring, and two large underbed storage drawers with built-in media storage dividers provide a convenient place for stowing books, media and other personal items. 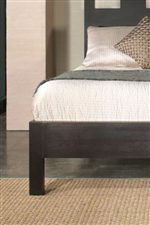 The frame is constructed from tropical Mahogany solids and Espresso finished veneers and features a clean, linear design with a contemporary headboard. This bed is available in Twin, Full, Queen, King and California King sizes. The Nevis King Riva Storage Bed by Modus International at Michael's Furniture Warehouse in the San Fernando & Los Angeles area. Product availability may vary. Contact us for the most current availability on this product. RV23F7RL1 King Size Riva Platform Bed Rails 1 2" 80" 7"